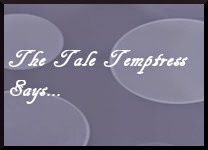 The Tale Temptress: Discussion Post: Does borrowing books support our authors? Discussion Post: Does borrowing books support our authors? My Discussion Topic This Week - How does borrowing books support our authors? Let me first say that I'm excluding ARCs or eGalleys from this discussion, as those are a different animal altogether. If I receive one of those, I feel like I'm paying for the book, in a way, because I'll be helping to promote it by providing an honest review and publicizing it to my blog, as well as online retailers. This is strictly a discussion about borrowing books. If I review the borrowed book as I would an ARC, promote it to my website, social media and online retailers as I would do an ARC, does that make up for the lack of royalty for the author since they are receiving the publicity and support? I like to think that borrowing books a little here and there is still showing support for the author by assisting in promotion of that book and its author, which is what the purpose of what I do is all about, in my view. Yes, I'm here to fangirl about books and authors that I love, but part of what I do, to me, is to help promote the books and authors that I love because I want them to succeed so that can continue to write great books for me to enjoy... which is something they may not be able to continue doing if they aren't making a living from their work.